LafargeHolcim is investing around €100 million in the modernization of the Martres-Tolosane cement plant in the South West of France. AUMUND Fo¨rder- technik GmbH and AUMUND France S.A.R.L. will be accompanying the customer on this ambitious upgrade project until well into 2019, supplying a varied range of equipment. The specialist from Rheinberg and Paris won an open bidding process against several competitors. AUMUND Fo¨rdertechnik is supplying a package including belt bucket elevators to feed the 96m-tall heat exchanger and the raw meal silo at the plant. Two AUMUND BWZ chain bucket elevators will be used to convey raw meal and filter dust, and for silo feed. An AUMUND KZB pan conveyor with a vertical lift of nine metres will be installed under the clinker cooler. 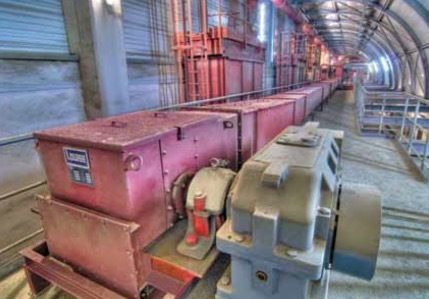 Seven AUMUND LOUISE-type drag chain conveyors with short centre distances of 13m and conveying capacities between 7tph (tonnes per hour) and 50tph will extract filter dust. Two CENTREX® machines (25–250tph) will extract a mixture of limestone and clay as well as iron ore from silos up to seven metres high. The modernization project at the Martres- Tolosane works is part of LafargeHolcim’s extensive €300 million investment project in France. Com- prehensive measures are being taken with a strong focus on environmental protection to make this plant, with its 110 employees, fit for the future. Once upgraded, the plant will be equipped to burn alternative fuels, and energy consumption and CO2 emissions will be greatly reduced. Work on the project will start in the final quarter of 2018 and be completed by mid-2020. The AUMUND Group is active worldwide. The conveying and storage specialist has special expertise at its disposal when dealing with bulk materials. With their high degree of individuality, both its technically sophisticated as well as innovative products have contributed to the AUMUND Group today being a market leader in many areas of conveying and storage technology. The manufacturing companies AUMUND Fo¨rdertechnik GmbH (Rheinberg, Germany), SCHADE Lagertechnik GmbH (Gelsenkirchen, Germany), SAMSON Materials Handling Ltd. (Ely, England), as well as AUMUND Group Field Service GmbH and AUMUND Logistic GmbH (Rheinberg, Germany) are consolidated under the umbrella of the AUMUND Group. The global conveying and storage technology business is spearheaded through a total of 15 locations in Asia, Europe, North and South America and a total of five warehouses in Germany, USA, Brazil, Hong Kong and Saudi Arabia.